The ongoing FARC peace talks have dominated Colombia’s presidential elections, with the two second-round candidates offering opposing stances on the peace process. Sunday’s results could be crucial for its future. 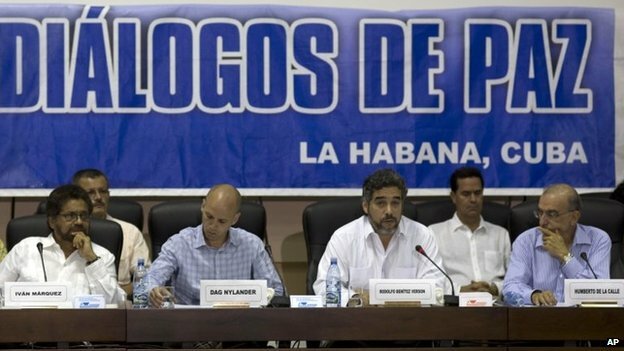 Peace talks in Havana, Cuba, between the FARC and the Colombian government. Photo courtesy of AP via the BBC. The second round of Colombia’s presidential elections will be held this Sunday, 15 June, to determine whether President Juan Manuel Santos can secure a second four-year term, in the face of vicious competition from his right-wing opponent, Óscar Iván Zuluaga. Santos has been the lead driver of the government’s efforts to seal a peace agreement with the Marxist-Leninist guerrilla group, the Fuerzas Armadas Revolucionarias de Colombia (Revolutionary Armed Forces of Colombia – FARC), hoping to bring to an end half a century of internal conflict between the FARC, the Colombian state, and right-wing paramilitary groups. However, while surveys seem to suggest that Colombian society is predominantly war-weary, and increasingly in favour of the peace talks – which began in Havana, Cuba, in November 2012 –, Santos’ strategy has come under very heavy fire from those sectors who would prefer to see the FARC beaten into the ground and defeated definitively on the battleground. Among these sectors is Santos’ predecessor as President, Álvaro Uribe, under whom Santos served as Defence Minister. Uribe’s neo-con approach to Colombia’s armed conflict against the FARC and other rebels has led to him voicing incredibly vocal opposition to his former political ally, and eventually compelled him to found his own political movement, Centro Democrático (Democratic Centre – CD), with a view to challenging Santos’ centre-right coalition in this year’s elections. After a decent showing in March’s legislative elections, becoming the main opposition, Uribe also gave his backing to the candidacy of Zuluaga for the presidential elections. At first it appeared that Santos, despite sluggish approval ratings, was coasting for re-election, and that in fact if there was any competition from other pretenders to the presidency, that it would come from the Green candidate Enrique Peñalosa. While Peñalosa’s challenge ran out of steam, eventually resulting in fifth place with 8% of the vote, Zuluaga’s bid has gone from strength to strength. In the first round held on 25 May, he topped the poll with 29%, ahead of Santos’ 26%. With no-one achieving 50% of the vote, a second round was called. Óscar Iván Zuluaga, the Colombian presidential candidate who, if elected, may well shatter hopes for a successful conclusion to the ongoing peace talks between the Colombian government and the FARC. The tight race and bitter campaign between Santos and Zuluaga, with opinion polls ahead of the decisive vote suggesting that the two are neck and neck, reflects the polarisation of the political debate that has taken hold across Colombia, in particular when it comes to the peace talks. While Santos has attempted to portray the election as a virtual plebiscite on the peace process, Zuluaga has continued to reflect the fierce opposition shown by his mentor Uribe to the Santos government’s tack from militarisation to dialogue. Zuluaga has said that if elected, he would immediately suspend the talks, which have now progressed beyond the half-way point after last month’s provisional deal on the third of five key points: the ending of the FARC’s links with narco-trafficking, following agreements on land reform and political participation. The results of the first round have also prompted Santos to re-establish himself as the more liberal candidate on offer, against the often aggressive right-wing and reactionary rhetoric of Zuluaga. This is despite the fact that Santos has traditionally been positioned to the right of the centre of the political spectrum, and has generally promoted neoliberal policies. With the two candidates being so close, but having also gathered between them just 55% of the first round vote, the past few weeks have seen a desperate scramble to secure the backing of the other three candidates and their supporters. Another factor to take into account is the 60% of the registered electorate who didn’t turn up to vote for the first round. While this leaves plenty of potential targets for the two candidates to try and win over, the high abstention rates are also a potent sign of the levels of dissatisfaction among Colombians with their politicians. In March’s legislative elections, no single party managed more than 10% of the potential vote, with Santos’ coalition coming ‘top’ with 18% on a 40% turnout (9% of the registered electorate). President Juan Manuel Santos, who has been key to the peace process going ahead, is seeking re-election. Photo courtesy of Infolatam. Nevertheless, with the central feature in the second round continuing to be the debate over FARC and the peace process, it remains clear that Colombia’s best shot at bringing about an end to its conflict is dependent on the outcome of the election. As Zuluaga, with Uribe apparently pulling the strings backstage, threatens to put an end to the talks and revert to all-out armed conflict if he becomes President, Santos has tried his best to make this point clear and urge Colombians to back him, even if they wouldn’t usually consider voting for a centre-right, economically conservative candidate such as him. It is for this reason that the leftist and Green candidates from the first round are calling on their supporters to back Santos, with other social movements – including a leading indigenous figurehead – suggesting that they will do the same; not through an active endorsement of Santos’ first term as President and his political programme, but simply through a burning desire to end half a century of bloody conflict that has seen over 225,000 Colombians killed and more than five million forced from their homes and communities. Just a few days ahead of the election, a group of 79 leading Colombian businesses also made clear their support for Santos, citing the need for peace and stability to ensure Colombia’s future prosperity. Colombians will have to choose “between those who want an end to the war and those who prefer a war without end”, according to Santos, with a barbed reference to Uribe and his supporters. Zuluaga, on the other hand, has insisted “we cannot allow the FARC to attempt to command the country from Havana”, initially pledging to give the rebels one week to lay down their arms before stepping up an all-out military assault. Since then, however, he has toned down his rhetoric slightly, suggesting that he would not be completely opposed to the continuation of the peace talks, so long as there were far stricter conditions on both the FARC’s activity in the meantime, and on the punishment their leaders would have to face as part of a peace deal. Critics, with Santos among them, claim that this is merely electioneering at its most cynical and opportunistic. With many if not most of Zuluaga’s backers – with Uribe foremost among them – baying for blood, a victory would surely lead to sustained calls from within his own ranks to follow through on his promises and banish the FARC negotiating team back to the warzones of the Colombian rainforests. Critics also point out that the past record of Uribe makes it hard to believe that this apparent shift in stance is anything more than just a façade. Furthermore, Zuluaga’s critics have said that the newer, apparently ‘softer’ conditions that he wants to impose would still be nigh on impossible for the FARC to accept, meaning that they would probably lead to a breakdown in the talks. His strategy seems to be based on a belief that the Colombian state could win the war on the battlefield if it really wanted – a premise not exactly backed up by years of evidence with military stalemate having led to the Santos government attempting to end the war via another means: that of formal dialogue and negotiation. Santos vs Zuluaga. Peace vs War. That, apparently, is the choice on offer for Colombian voters. Photo courtesy of Infolatam. Jonathan Glennie, the well respected Guardian columnist and Bogotá-based writer on international development, sums up the extent to which the stakes have been raised in this article on the topic. He says that “after four years of the government moving painstakingly from the language of war, which characterised the previous administration, a hard-right wing presidential candidate [Zuluaga] could end the fragile dream of peace and modernity in Colombia for another generation”. “The international community”, he continues, “which has invested so much over the years to support peace and prosperity, will find it hard to understand if Colombians needlessly turn their back on peace”. This is a sentiment that has been echoed among sectors of the Colombian media – in both its traditional and social forms – who support the peace process, calling on voters to put aside any ideological differences and general dissatisfaction with Santos, and to vote for him to keep a far worse option out. Glennie compares this situation to the French election in 2002, when incumbent Jacques Chirac was up against Jean-Marie Le Pen of the far-right Front National. On that occasion French voters heeded the advice and re-elected Chirac with close to 80% of the vote. While France was not, of course, in a long-term state of war such as Colombia has been, and nor is the Santos-Zuluaga distinction one that is so obviously good-vs-bad (or bad-vs-less-bad), the historical example is a valid one. The Colombian electorate as a whole should consider this scenario carefully, and in particular look to how those who live in or around the frontline of the Colombian conflict plan to vote. They are overwhelmingly in favour of the peace process, and by extension Santos, whereas Zuluaga’s greatest support comes from the large urban centres such as Bogotá, for some time well removed from the everyday violence and terror of the armed conflict. It couldn’t be much clearer. Santos is right: the Colombian presidential election really is a choice between maintaining the prospect of long-sought peace, or turning their back on this offer and ushering back in a renewed period of violent conflict. It’s a very tough call, and Colombia has it all to play for.